Hamlin louvered roof cupolas are ideal for roofs with up to a 10/12 pitch; they can add the perfect balance of simplicity and style. With sturdy, weather-resistant vinyl construction, they’re made to last as long as your home, your commercial building or any other structure. Each features a perfectly polished, 16-ounce, 24-gauge copper roof for added style. 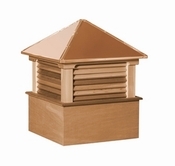 The four sides of Hamlin roof cupolas feature precision-cut louvers beneath upper molding. Several sizes are available, from 18 inches wide and 23 inches high to 72 inches wide and 99 inches high, so finding the right size for your building is a snap. 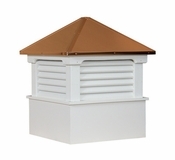 These simple cupolas are weathervane-ready; all you need is an 11-inch extension rod and you’re ready for classic style. At Millworkcity, we pride ourselves on stellar customer service. If you’re having a hard time deciding which size Hamlin roof cupola you need, or even what type is right for your structure, let us know and we’ll be happy to walk you through your options.